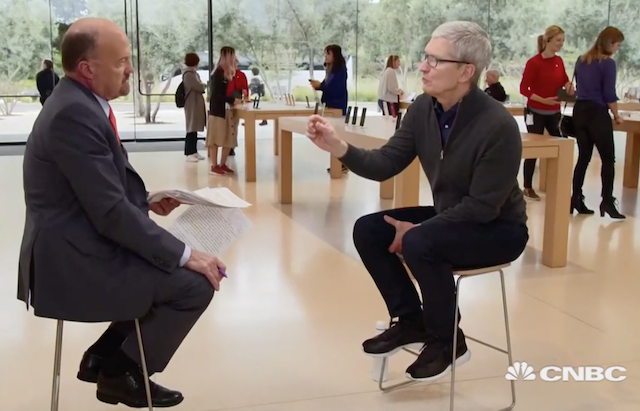 In an exclusive interview with CNBC’s Jim Cramer earlier today, Apple CEO Tim Cook has addressed the negative sentiment around his company following the recent revenue forecast downgrade, saying that Apple’s growing ecosystem of devices and services is “probably underappreciated” by naysayers on Wall Street. “In terms of the naysayer, I’ve heard this over and over again,” said Cook during the interview. “I’ve heard it in 2001, I’ve heard it in 2005, in ‘7, in ‘8, in ’10, in ‘12 and ’13. You can probably find the same quotes from the same people over and over again”, Cook continued. “I’m not defensive on it. This is America and you can say what you want”. “I’m never surprised by the market, to be honest with you, because I think the market is quite emotional in the short term,” Cook said when asked about Wall Street’s reaction to the news. “We sort of look through all of that. We think about the long term”. Meanwhile, veteran analyst and former Apple employee Ben Thompson has explained Apple’s failure to predict its holiday quarter by ‘three errors’ in a recent article over at Stratechery. At the same time, however, the analyst also believes there are three reasons for optimism about Apple’s future. Apple will officially report its first-quarter earnings on Feb. 7.